PITTSBURG, NH – The last few miles of the road to Canada are about the loneliest in New Hampshire. It’s a dozen miles from the Second Connecticut Lake to the border, along a roadway that has no utility poles, no homes and very few travelers. Benign on a sunny late spring day, Route 3, which cuts through thick evergreens before giving way to Route 253 and a breathtaking panorama of Quebec, is silent, punctuated only by sounds of the woods – a bird song and a breeze rustling through the trees. About 3 miles south of the border, there is a simple white cross bearing a weathered plaque at the roadside and it tells a tale of another time and a harsher season at the very top of the state. 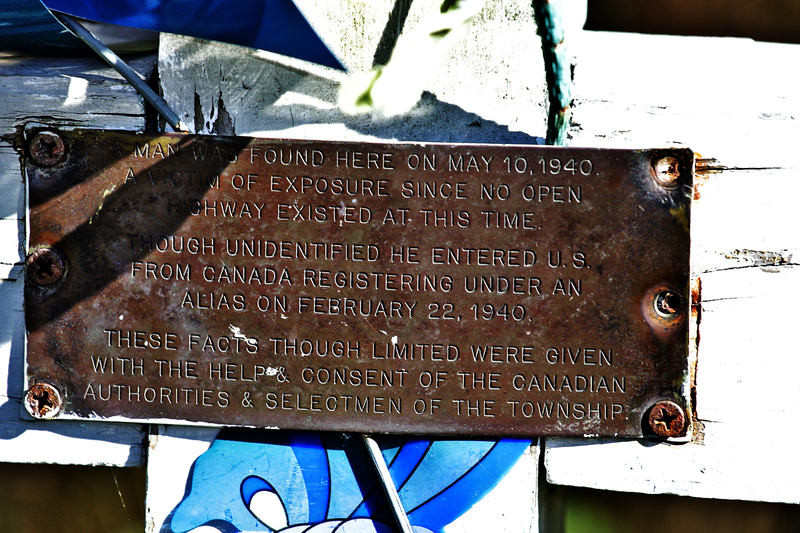 Up until five years ago, Marty Hewson tended New Hampshire’s only border crossing to Canada. For 27 years, twice a day, he passed by the cross and heard the lore of the unknown man from old timers in the village of Chartierville, just over the border. By 1940, New Hampshire’s border station had only been open for two years and it closed in the winter because plows did not run the gravel road 12 miles north of Second Lake. In those days, Canadian customs was located in the home of the local inspector and the man, whom Hewson said he was told appeared to be a Native American, checked in there, using a false name, after making a stop at the Chartierville Hotel. “The people there told him not go, that it would be miles before he would see a house, but he went on his way just the same,” Hewson said. By all accounts, it was cold that day, well below zero and deep snow had settled over the gravel road. When the man set out into the snowy land, that is the last time anyone would see him for three months. In early May that year, the crew sent north to open the road found the man’s body and his description matched that of the stranger setting forth to Pittsburg three months earlier. The man was buried in a pauper’s grave in West Stewartstown, some miles to the south of the border. To this day, no one knows who this man was, where he was from or going to, or if he left behind a family as puzzled by his disappearance as those were who found him. These facts, though limited, were given with the help and consent of the Canadian authorities and selectmen of the township. The late Louis Beauchemin was a supervisor on that road crew that found the stranger’s body and not long after that, Hewson said, he erected the cross at the spot where his body was found. When Beauchemin died, Hewson assumed the upkeep of the cross, mowing the little plot by hand and brushing a weed whacker around it. Six years ago, he made a new cross out of pressure treated lumber. Last year, he gave it another coat of white paint. Hewson collects the coins to give to charity. 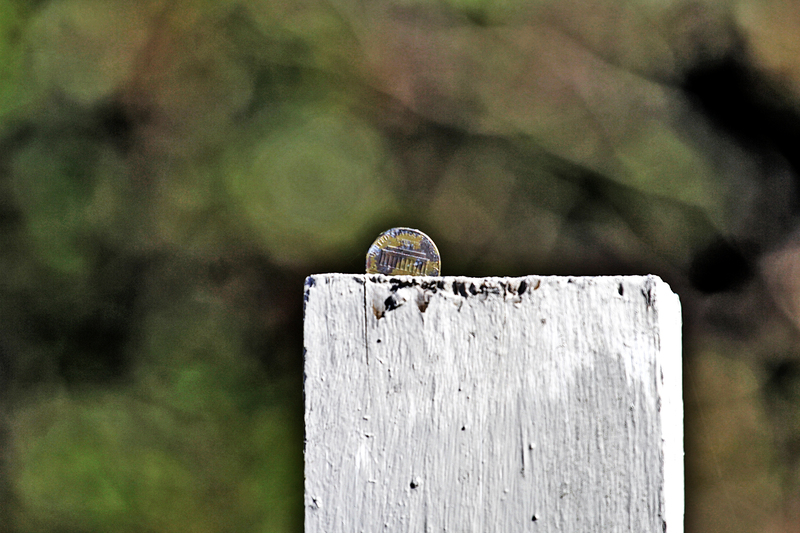 Earlier this month, someone had stopped by the cross and placed a few dandelions on it. A quarter was tucked under the plaque. “Somebody usually puts some artificial flowers there every year, but I haven’t seen them yet,” Hewson said. He does not know who makes the pilgrimage to do that simple gesture, although he suspects it is a Massachusetts couple who once sent him a clipping about the cross. 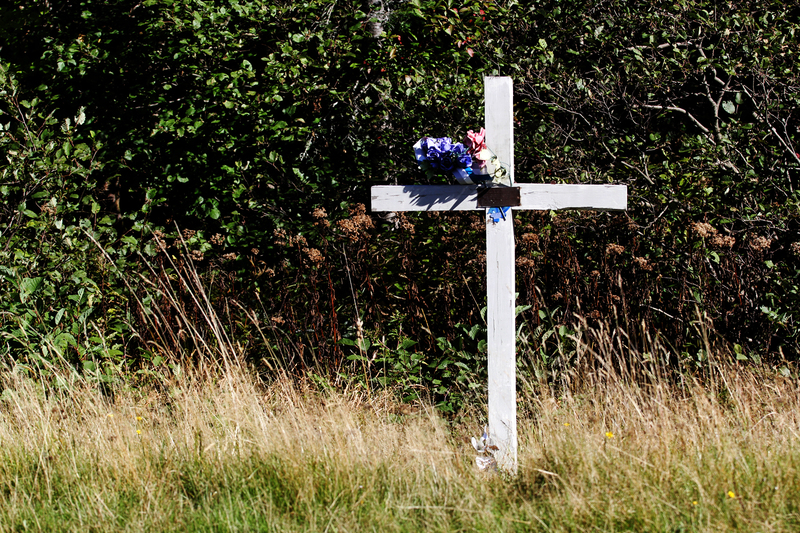 In the summer, the cross gets its share of visitors, who leave wild flowers and money. Hewson collects the coins or bills and gives them to charity. He removes the plastic flowers before the first snow fall. The wild flowers wither and fade on their own.